Last week, Barclays Africa released their our 2015 Integrated Report (PDF). It comes in the backdrop of the Barclays Africa sale that is still reverberating, with denials that the Bank will be divesting from Africa. 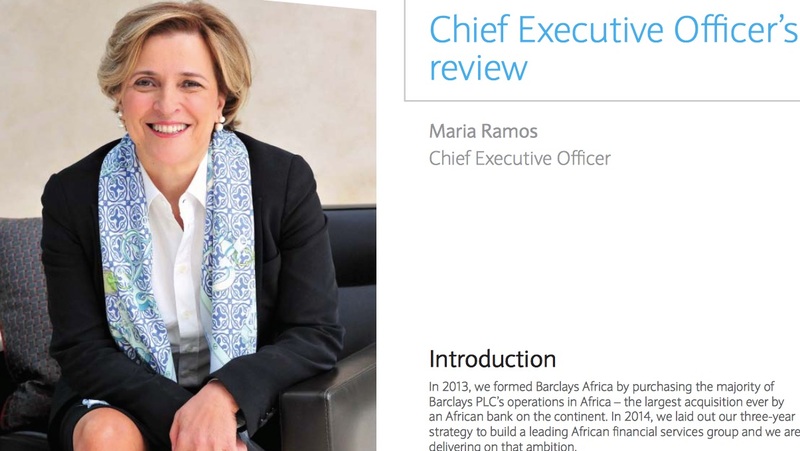 The Barclays PLC sale is meant to deconsolidate Barclays Africa from an accounting and regulatory perspective and that the Barclays Africa chairman, Wendy Bull, has already resigned from two Barclays (UK) PLC boards so there’s no conflict of interest. The 2015 results demonstrate that we are delivering against our strategy and ambition. We made a profit of R14.3bn, with headline earnings up 10% and a return on equity of 17%. Barclays parent owns, 62%. The other top 10 shareholders include Public Investment Corp (SA) with 5.6%, Stanlib assets 2.2% and others with 1% each including old Mutual, Sanlam, Prudential, Vanguard, and Blackrock. Barclays Africa has 12.3 million customers. Retail & business banking account for 72% of revenue, corporate & investment-banking 20%, and wealth management 7%. They paid 8.6 billion rand in dividends, 7.3 billion in taxes and 20.9 billon rand in salaries to their 41,000 employees across Africa. The report (We actively sought shareholder views so as to further develop our remuneration reporting) has a levels of disclosure,that would be welcome in Kenyans banks and companies who have endured a horrible year of governance issues with almost 20 companies declaring profit warnings after previous ‘robust’ years, under long-serving CEO’s. It details the salaries and bonus of the CEO (Rand 28 million), top executives, and non executive (independent) directors of board members (which included the Barclays Kenya chairman). It also lists the performance dashboard of al the executives, and of all the key segments of the bank in their own pages. Not like Kenyan banks which have the Chairman’s statement noting the tough economy, then (after magic happens) the super profit that was achieved. It lists key matters discussed by the board , tabled month by month, and incorporates the balanced scorecard. No individual director or group of directors has unfettered powers of decision-making. 1 Rand was about Kshs 7.2, and 1 Rand was about $0.07 in December 2015. This entry was posted in Barclays, Basel II, Corporate governance, South Africa and tagged ABSA, Barclays, BAsel on April 3, 2016 by bankelele.